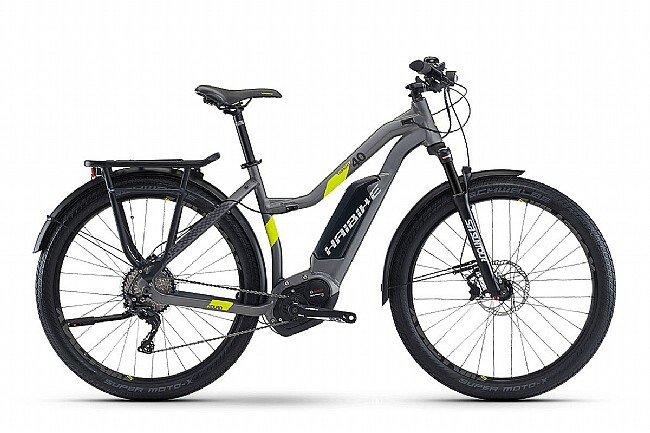 The Hai Bike XDuro Trekking 4.0 LowStep E-Bike is designed for going the distance in comfort, and with ease. Featuring the Bosch Performance CX Drive Unit and a durable, lightweight 6061 frame, the XDuro Trekking 4.0 can easily reach speeds of 25 km/h to blaze up a climb, or make up lost time on the flats. Frame Material: Hydroformed aluminium 6061, step-through design. Drive Unit: Bosch Performance CX, 250W, 75Nm, 25km/h. Battery: Bosch PowerPack, 500 Wh. Charger: Bosch quick charger 4A. Fork: SR Suntour NCX E45-LOR Lockout, air, Travel: 60mm. Headset: A-Head Tapered, cartridge bearings. Shifters: Shimano SLX M7000 Rapidfire. Rear Derailleur: Shimano Deore XT M8000 Shadow Plus, 11 speed. Chain Ring: SRAM X-Sync, 16t. Cassette: Shimano SLX M7000, 11-42t. Brakeset: Magura MT4 hydraulic disc brakes (180mm / 160mm). Handlebar: Haibike Components TheBar ++ Topflat 720mm. Seatpost: Haibike Components TheSeatpost ++, patent, 31.6mm. Tires: Shcwalbe Super Moto X, 27.5" (62-584).